"I think Mike (Portnoy) and I have mastered the art of ‘strategic wankery’!" Keyboardist Derek Sherinian first landed on our radar as a member of the East Coast progressive metal act DREAM THEATER. He’s performed with some big names in hard rock and metal from KISS to Alice Cooper to Billy Idol to BLACK COUNTRY COMMUNION who have new music out with BCC IV. KNAC.COM spoke with Sherinian on October 13th from his home in So Cal. “It's very nice here. It's sunny, warm, I'm getting my cardio in and doing interviews,” says Sherinian who is doing press for a new band SONS OF APOLLO. 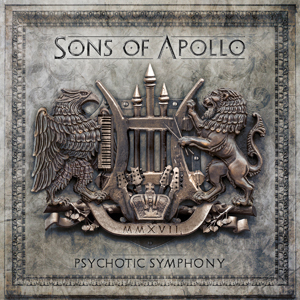 Sherinian and SONS OF APOLLO have a debut album titled Psychotic Symphony, released on October 20th. Sherinian of course is on keyboards and he's reunited with another former DREAM THEATER member, Mike Portnoy [DREAM THEATER, ADRENALINE, THE WINERY DOGS]. They're joined by bassist Billy Sheehan [TALAS, DAVID LEE ROTH, MR. BIG, THE WINERY DOGS], guitarist Bumblefoot [ART OF ANARCHY, GUNS N' ROSES] and singer Jeff Scott Soto [SOTO, YNGWIE MALMSTEEN, JOURNEY]---what a line-up, right? KNAC.COM: It’s been awhile since we spoke for an album release. When we last spoke you were promoting Blood Of The Snake which contained a cover of “In The Summertime” which featured a few guests. One of the guests on the track was Billy Idol, who you had a great run with as touring keyboardist. SHERINIAN: Yeah, that’s right. I had heard that he had an opening and I auditioned. I was with Billy for 11 years, it wasn't a full-time gig because he’d pretty much tour in the summertime doing casino shows. It was a great time, he's a fantastic performer and an all around great guy. KNAC.COM: You also provided some keyboards with KISS on the Revenge tour. How did you land that role? What was that experience like? SHERINIAN: Eric Singer [KISS drummer] is my best friend, we played together in the Alice Cooper band then he brought me into that audition for the KISS tour. I was hired right away, I provided background vocals, keyboards and some sound effects, like explosions and things like that. It was a great experience. I was off stage so that was kind of strange to me but at the same time it was KISS and I saw it as a great opportunity to learn from Gene [Simmons] and Paul [Stanley]. That kind of thing you can't learn in books or download from an app, you have to be hands on. I really valued that experience. KNAC.COM: I had nearly forgot about your time with the Alice Cooper band. SHERINIAN: Alice gave me my first break. I played with him sporadically through late ‘98 if I recall correctly. KNAC.COM: You also performed in studio and live with Yngwie Malmsteen. What was that like? I've met him and interviewed him on a few occasions. He's got an ego, no question. He’d even admit to that. Do you think he gets a bad rap? SHERINIAN: Yngwie definitely speaks his mind and he's unfiltered. I think when you have an unfiltered personality you're going to make some people unhappy inevitably. I will say that Ynwgie is one of the greatest musicians that I have ever had the pleasure to work with, he's a force of nature. His fluidity on his instrument and the fire that comes out is just unparalleled. KNAC.COM: You're right about being unfiltered. Yngwie upset a number of his former singers recently. One was ironically Jeff Scott Soto, who sings in SONS OF APOLLO. KNAC.COM: We know your work with DREAM THEATER. It didn't end how you would have liked. How do you look back on your time in that band? SHERINIAN: I'm so grateful for my time in that band because it made me step up my musicianship. As a kid my dream was to land a gig in a rock band not a prog band; DREAM THEATER was a great experience and the first time people got a chance to hear me play. It put my name on the map and was instrumental in setting up my solo career and a lot of other things actually--for that I'm grateful. KNAC.COM: BLACK COUNTRY [COMMUNION], you just unleashed your 4th effort, BCC IV. It appears at this point that BCC will be more of a recording entity than a touring act. I think most of us fans would rather have that than nothing. KNAC.COM: I have spoken with people that have done some recording with Glenn. They've made mention that he records vocals in one take. Have you this in BCC? KNAC.COM: Things are top notch with BCC. SHERINIAN: I agree, in both bands actually, we have such high quality control with SONS OF APOLLO too. I’m just so grateful to be a part of two amazing super groups with these such amazing musicians. KNAC.COM: Often times when bands are put together with players with history in other bands that chemistry isn't there. That’s not the case with SONS OF APOLLO, there’s not a weak link in this band. SHERINIAN: Thank you. What's amazing is that I met Bumblefoot for the first time on day one in the studio; it felt like I had just met a long lost brother for the first time. I felt like that time in the studio it was like we were making up for lost time. The chemistry that you hear is a correlation from those sessions. I'm so excited about the future after we've done a couple tours and we get into the studio for another record. KNAC.COM: When I heard about this band I assumed that it was going to be a ‘progressive metal’ band but it's that and a rock band, a classic rock band and a metal band. SHERINIAN: Absolutely right, when Mike [Portnoy] and I met and we decided to move forward with SONS OF APOLLO we thought it would be prog-metal but when we started writing for the album all our classic rock influences came to the forefront. We put the virtuosity in a special place because we didn't want it to take away from the song. I think Mike and I have mastered the art of ‘strategic wankery’! [laughs] We didn't want the musicianship to be so overbearing. When the vocals come in the songs are very ‘classic rock’ and very straightforward. We didn't write or record anything beyond Jeff Scott Soto’s range. I think SONS OF APOLLO are the perfect balance of feel, rock ‘n' roll swagger and virtuosity; it’s the perfect blend but we’re coming from a rock standpoint, we’re adding the virtuosity not the other way around. KNAC.COM: When it came down to production, Mike and you elected to produce. You could have gotten a big name like BCC has with Kevin Shirley who is essentially the fifth member of the band. SHERINIAN: Let me ask you a question. How does this record sound? SHERINIAN: Yeah. Straight across the board. KNAC.COM: It doesn't sound overly compressed or brick walled. It sounds like a classic sounding album. No one person sounds louder than the next or is buried in the mix. SHERINIAN: I agree. I think the mix is fantastic. It was mixed by Jay Ruston. He does an excellent job I'm making sure that the mix isn't too loud. It's interesting that you said it sounds like a ‘classic record’ and not over-compressed. This record is compressed to a point, it is modern sounding as opposed to a classic YES record or a LED ZEPPELIN record. There is some compression but the fact that you didn't hear that is great. To answer the previous question about the production; Mike and I have been making records for 25 years. We don't need an outside producer like Kevin Shirley or anyone else coming into the studio and putting their spoon in our stew. As long as I have a guy like Jay Ruston to mix the record, we’ll be fine.